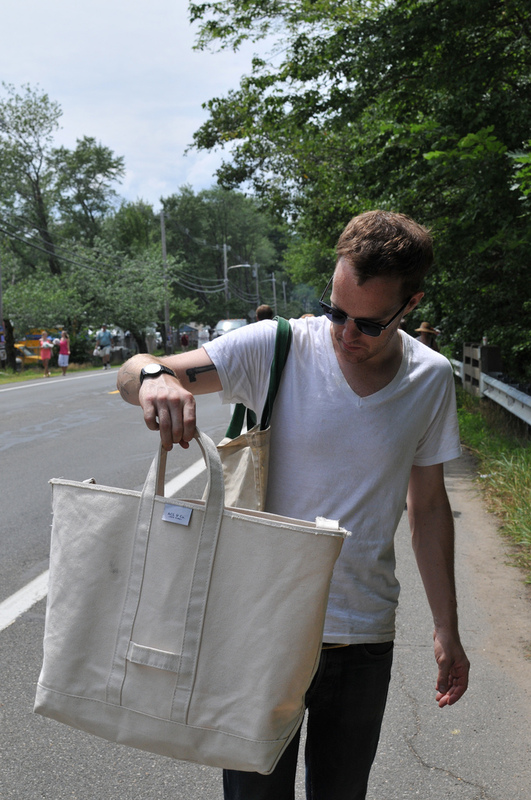 Brimfield in the Summertime | A Continuous Lean. 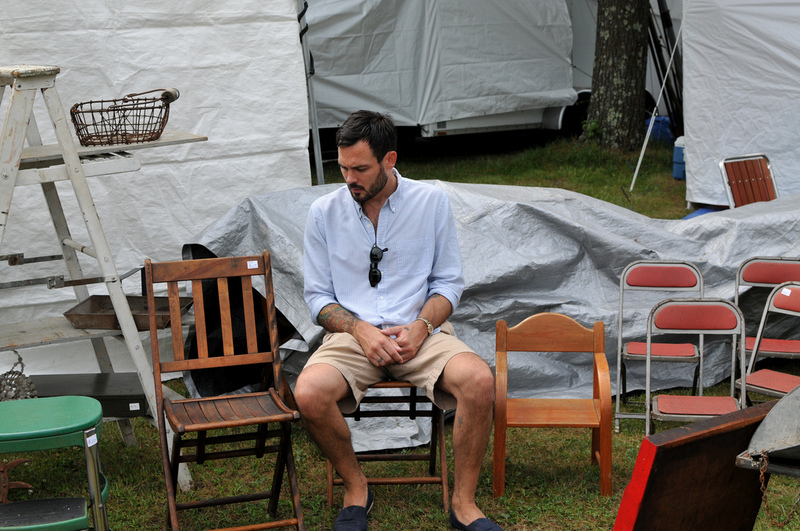 It’s that time again – Brimfield. Though with schedules being as they are this time of year, my hombre Sean Sullivan and I had to execute a surgical strike. With motel reservations in hand, cash in wallets and a do-or-die spirit in our veins we set out on a 24 hour mission into the heart-of-antique-darkness. And let me tell you, this show had a different vibe then our May trip. First of all it was a hot mess up there – like a soup sandwich. I deployed gingham in the hopes of camouflaging my perspiration, but the Massachusetts humidity definitely won that battle. Secondly, the turnout was much lighter than the spring show. Maybe that was because we were there for the opening bell, or maybe it was the heat. Either way we had a blast and picked up some gems. 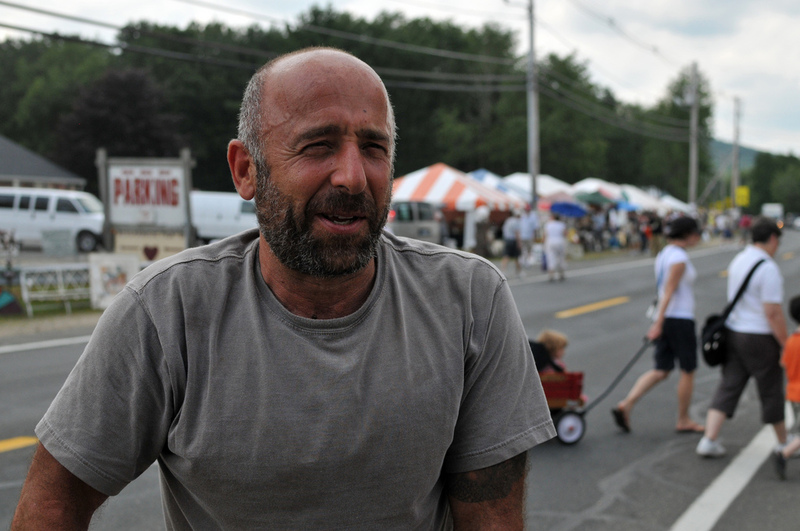 Before I post more of that good ole Americana, I thought it would be fun to show you some of the people we encountered at the world’s largest outdoor antiques market – summer edition. Enjoy. I was shopping the same field as this cool Japanese couple, just a few rows behind. I was trying to catch up with them to get a picture but then they just disappeared. That was right around the time we were heading out, so I figured I had missed my opportunity. Luckily they just went to drop off some stuff at their car and we caught them on the way back in. Team Jack Spade. Note their matching backpacks. Lighting genius Gadi Gilan from the ACL film that Sean Sullivan and I made. Kyle from Sit and Read furniture inspects the canvas. That’s #8 duck. Respect. These folks were kind enough to pose for a snapshot. That’s Chris from Stanley & Sons on the right. No telling who the gent in the background is. Sullivan takes this stuff seriously – look at the man's concentration. In the end he did buy the chairs. Good pick brother. That’s Bailey Hunter Robinson in the second to last picture, a very talented tattoo artist working at Saved Tattoo in Brooklyn, NY. As with the last time you went, this looks fantastic. The Japanese guy (forgot his name) owns one of the best vintage shops ever (Tokyo’s J’Antique). 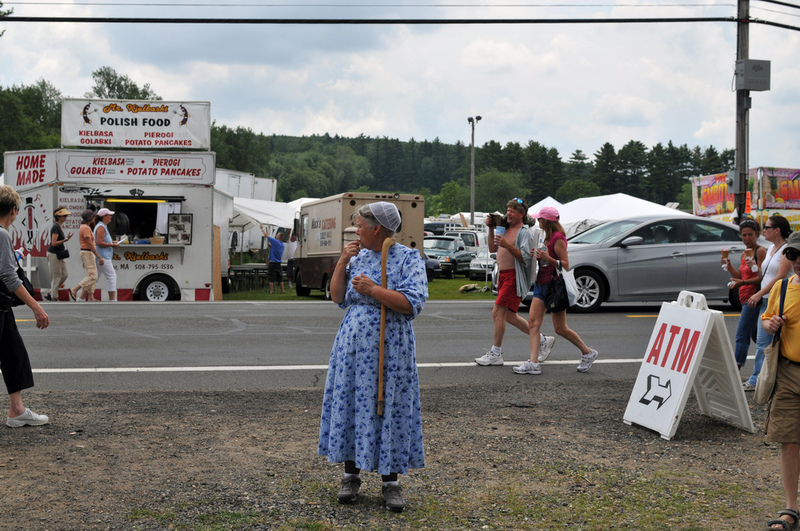 The July Brimfield show is always smaller than the May and September shows. Nice tote, what company is that from……. That’s a great picture of Bailey. Super nice bloke. That Japanese cat has a sick chore cap with a buckle strap! Thanks for sharing! Love all these Brimfield posts. Damn shame we Europeans have to miss it! Great post, can you recommend a place to stay up there? Going up tomorrow and might end up trying to book something and come back Friday. Thanks. Try the Motel 6 in Chicopee, which will run you about $64.99 a nite. Though it’s about 25 minutes down the Mass Pike, their rates are much more reasonable than the places nearby in Sturbridge or Brimfield. I normally stay at the Hilton in Springfield, or at the Motel 6 in Sturbridge. That’s a fine looking cap that Japanese guy’s rockin’. Anyone know the make? what’s wrong with wearing toms? Fabulous. I am going to Brimfield tomorrow. It will be my first time there and I cannot wait! Brimfield virgin baby!!!! $15 a night will get you a swell lakeside campsite at Wells State Park. That’s my secret (not anymore) spot. It’s only 15 minutes from the fields. Oh, and I would not recommend going Friday-Sunday. The best vendors have already left and those who have stayed are picked over. I made that mistake my first year…..
Who are the members of Team Jack Spade? I love that photo. You won’t find Toms here. Or flip flops. Or jeans tucked into boots. Just found this site via forty sixth and grace, I have no idea what it’s about but am loving this post & look forward to seeing the rest. 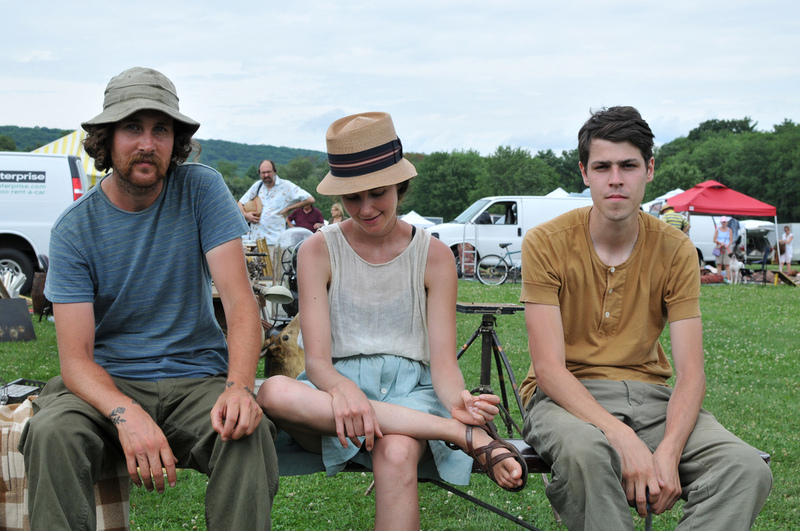 Some handsome folks at Brimfield! 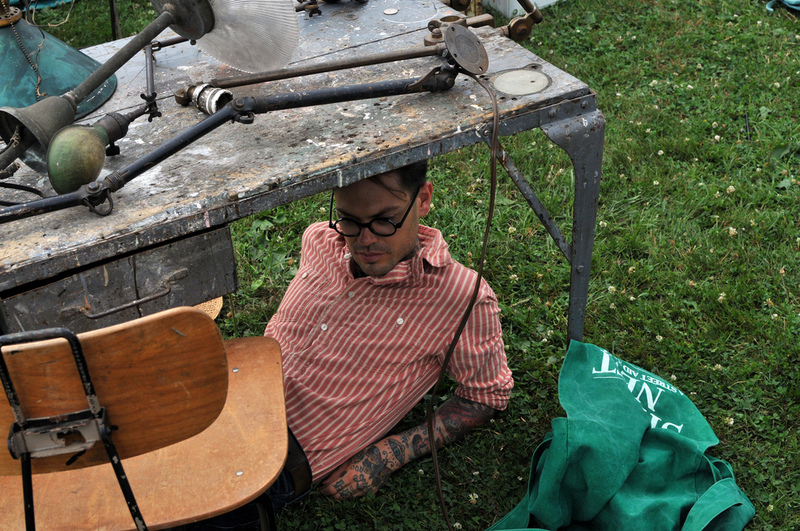 I just saw the guy in the hat from team Jack Spade at an antique mall in Whittier, CA yesterday… bizarre.